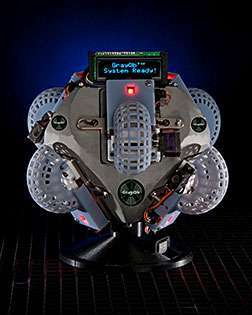 GrayQb device is approximately the size of a soccer ball and can be controlled remotely. Nuclear facilities in the midst of cleanup due to normal routine or unexpected incident face a remarkable challenge – how to safely determine the exact location of radioactive contamination. Such determinations are typically performed with portable count rate instruments operated by personnel wearing protective gear, which can consume many man-hours and expose personnel to radiation or contamination. Some areas may be too small or confined or have limited entry for personnel access. Some areas may be too large, perhaps encompassing a city street, or problematic in another way, such as a fluctuating area of storm water runoff. Scientists at DOE's Savannah River National Laboratory have developed an innovative new technology named GrayQb. This device is approximately the size of a soccer ball and can locate, identify, and generate a map of radioactive contamination within an enclosed area or outdoor environment or near water sources such as storm drains. SRNL Environmental Science and Biotechnology Principal Engineer Dr. Eduardo B. Farfan, and SRNL Applied Computational Engineering and Statistics Senior Engineer J. Rusty Coleman developed this cutting-edge technology. "The GrayQb device was developed to allow inexpensive, remotely-deployed radiation mapping in harsh environments such as hot cells and gloveboxes to aid in locating contamination for D&D efforts," Coleman said. "This technology reduces worker dose and cost by locating sources of contamination without placing personnel inside radiation areas." "This is a perfect example of the ingenuity and talent SRNL has to offer in environmental cleanup and risk reduction," said Savannah River National Laboratory Director Dr. Terry Michalske. "Through the hard work of Eduardo and Rusty, new options are being made available to improve safety and reduce the risks associated with pinpointing the source of contamination. This technology further demonstrates the SRNL intellectual leadership in the success of the EM cleanup mission." GrayQb uses multiple layers of Phosphor Storage Plates (PSPs) that are highly sensitive to radiation. Even in low dose rate environments, this device can be used to expedite radioactive contamination cleanup operations. The PSPs from GrayQb are read on a commercially available scanner in which special software records and translates the exposure data to define the type and location of the radioactive source. PSPs are commonly used for imaging when the radiation source and dose rate are known, such as in medical imaging and non-destructive testing. PSPs allow high resolution, high sensitivity gamma detection, providing micrometer resolution and revealing milliroentgen levels of dose. In order to provide energy determination and identification of an unknown radioactive source and its intensity, the PSPs in the GrayQb are stacked into layers, separated by attenuation materials such as metal or plastic that provides progressive shielding of the stacked PSPs. A radiation source deposits the highest dose to the outer-most PSP, with each successive layer receiving less than the previous one. Based on the amount of exposure to each layer, the energy of the radiation can be determined. Modified configurations using other film types can be used for alpha, beta, or neutron detection. GrayQb is placed in an area of concern for a specific amount of time based on the expected dose rates. A set of motorized shutters shields the PSPs during placement and removal of the device. Once in position, the attenuated PSP layers are exposed to the sources in the area through a unique apparatus that locates the exact sites of radiation. GrayQb is then removed from the area and the PSPs are read in an optical scanner. Special software translates the PSP data into a map of the location, intensity, and energy of the source contamination. "Intensity" refers to the low-to-high radioactivity of the source, and "energy" refers to the type of radionuclide. This map can then be superimposed on a photograph or diagram of the contaminated area, allowing researchers to precisely identify contamination source and areas of concern.